Cool, cool. Just want to let you know that "What's Next?" doesn't show up as its own section in the table of contents on the side. Looks like it's a different heading size. I had trouble finding it. Is anyone of you active in the Ludum Dare community? I thought this might be a good place for Duality to be useful, but I somehow don't get around to actually participate and talk to them about it. I'm currently checking out Twitter with an AdamsLair account. Trying to establish the #Duality2D hashtag a bit more by contributing to it with some occasional devlog updates. In case you're on Twitter, feel free to follow me or post your game and plugin updates with a #Duality2D tag as well. Facepunch forums can be a great place to advertise Duality. There's the Programming section which contains everything about programming. Just wrote a post on Voat.co. 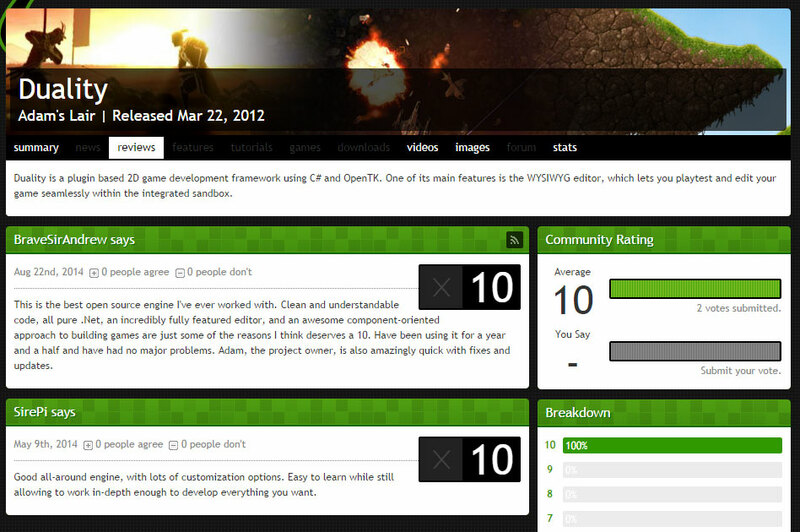 Added some of your user reviews from IndieDB to the main project site. My selection of them is mostly subjective, though I tried to pick the ones that would tell interested visitors the most about Duality and the way it works. Thanks to you all for writing those reviews in the first place! Might add more later, but I will of course ask everyone individually. Yay, I'm on there !